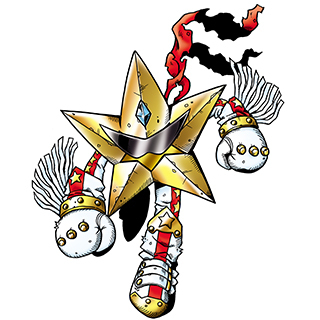 The space warrior Starmon turned into this Perfect level Mutant Digimon. It raised its self-satisfaction and clothed itself in a flashy outfit, making its debut as a star. Although it means to use its sunglasses as a disguise to conceal its superstar identity, they do not help at all. Its Special Move, Halley Squall, involves summoning countless meteors to rain down upon the enemy from overhead. 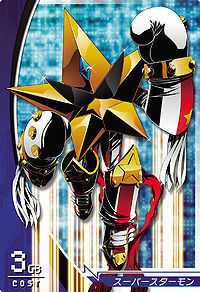 A superstar Digimon. 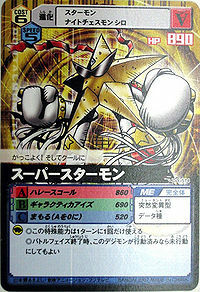 Its Special Move is Halley Squall. — Digimon Frontier: "This is the Digital World?! Escape from the Moon"
1} n., A widely acclaimed star who has great popular appeal. 2} n., One that is extremely popular or prominent or that is a major attraction. Anime/Manga Digimon Frontier: "This is the Digital World?! Escape from the Moon"
Halley Squall  ハレースコール Harē Sukōru Halley's Squall/Comet Cluster/Haley Storm Summons a rain of meteors from the sky. 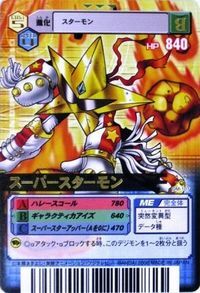 Galactica Eyes  ギャラクティカアイズ Gyarakutika Aizu Galactic Eyes Fires a beam or star-shaped pulses from its sunglasses, blasting or hypnotizing its opponent. 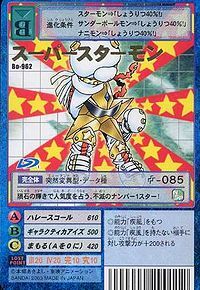 Superstar Seeker  スーパースターシーカー Sūpāsutā Shīkā Super Star Seeker Withdraws its limbs to become a spinning star that flies into the opponent while glowing. 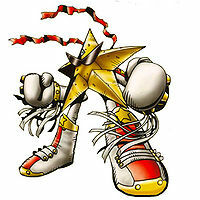 Superstar Upper  スーパースターアッパー Sūpāsutā Appā SuperStar Upper/Superstar Uppercut Attacks with a starry uppercut. 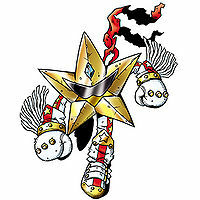 A Superstarmon was the leader of a group of Starmon on one of the Digital World's moons. He talks to the heroes briefly and shows them (through his telescope) the Royal Knights continuing to collect the data of the Digital World. 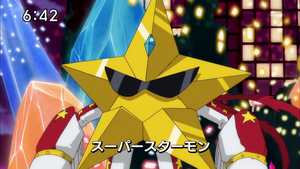 A Superstarmon was hunting celebrities, using a hotel as his residence. 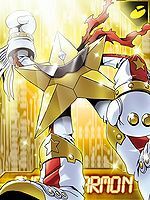 He's beaten by the efforts of Shoutmon X4, Arresterdramon and Astamon, before being Hunted by Amano Yuu, when the Digimon tried to hunt Kudou Taiki for his superstar collection. 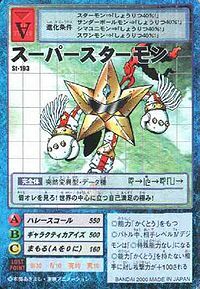 May evolve from Starmon at level 31. 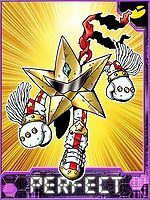 Can be evolved from Starmon if above level over 38, or can be found at Junk Factory. 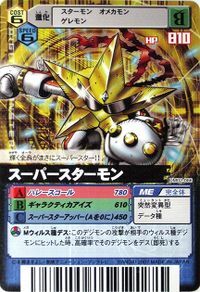 He can evolve into Justimon if above level 54 and Machine EXP above 12000. 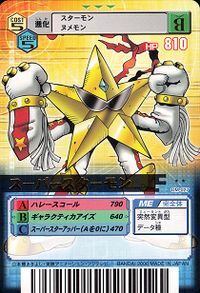 Can be evolved from Starmon if above level 41, attack 190, and Holy EXP 8800, or can be found at Trans-field. 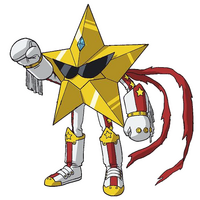 In Sunburst, an NPC character of Super Starmon can be found working at the Quest Counter, giving player a Holy type Digimon Quest Missions. Everyone look at me! It stands in the center of the world, the pinnacle of self satisfaction! This indestructible number-one star foretells its popularity by consulting the shining meteors! 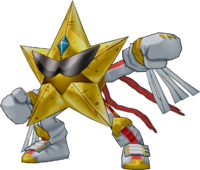 The space warrior, Starmon, admired Leomon and tried to improve its vigor, resulting in its debut as this admirable figure. Its true identity is painfully obvious despite having put on sunglasses. This page was last modified on 11 April 2019, at 03:41.